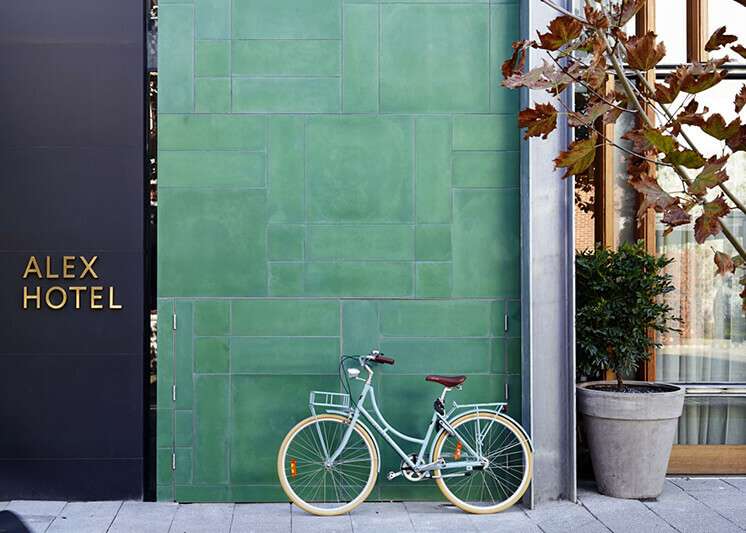 A vibrant city in it’s own right, Fremantle is renowned for its eclectic mix of art, alternative lifestyle and assembly of stylish cafes and restaurants – not to mention its proximity to those famous Western Australian white sand beaches. 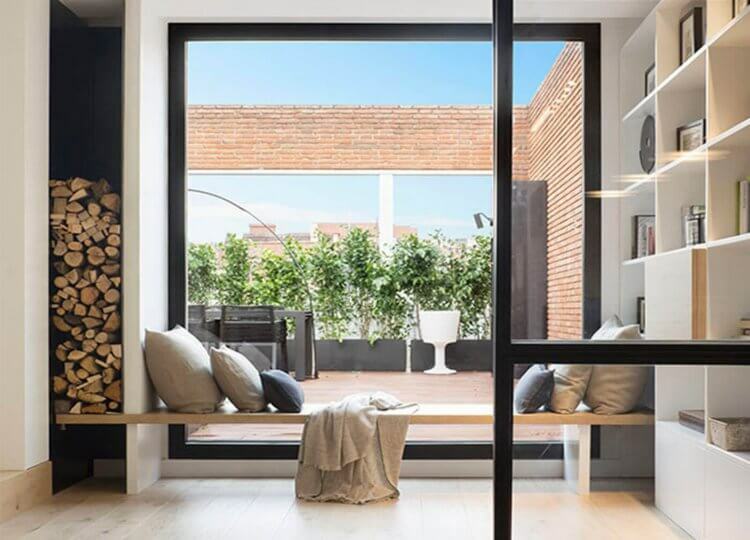 In a nutshell, the perfect getaway spot. 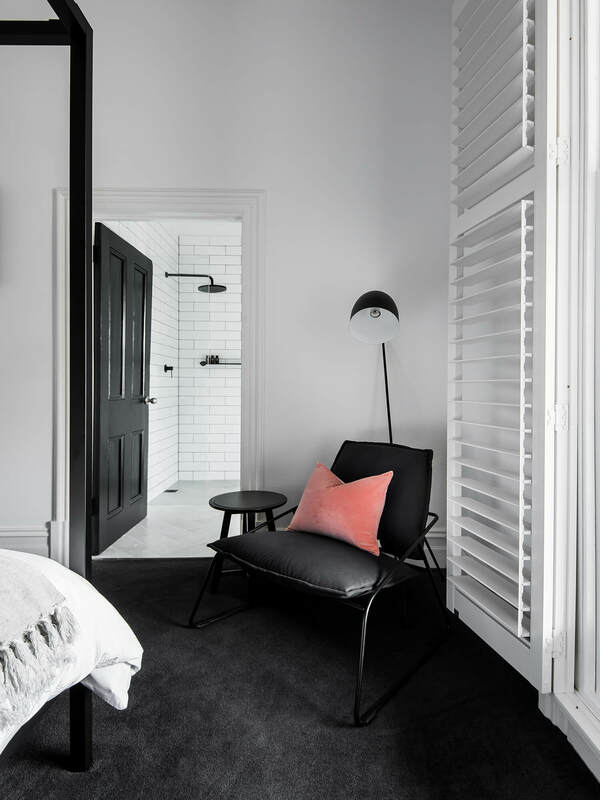 If it’s possible, it seems Perth’s hip port city just got even cooler with the opening of The Lodging. 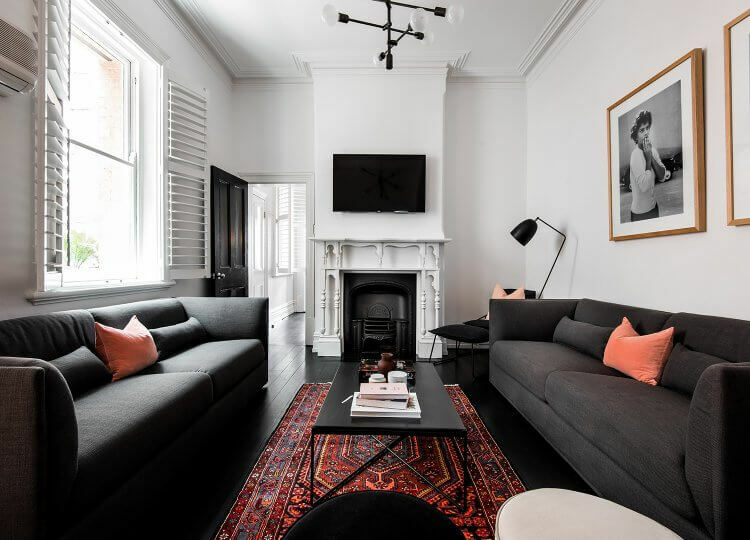 This is a contemporary hotel on a refreshing modern scale; a five-room boutique accommodation that looks right at home in its revived Victorian foundations. 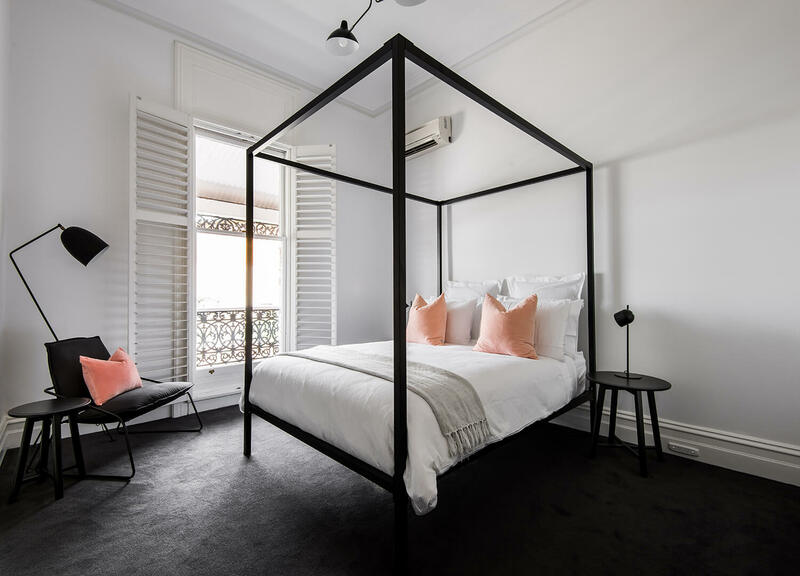 Occupying a late 1800s terrace converted into a four-room guesthouse that sleeps up to ten, “It’s not a B&B and it’s not a hotel” explains the owner and creative director Jane Peebles, “I wanted to design a beautiful interior that has the feel of a luxury boutique hotel but the intimacy and exclusivity of a private home”. 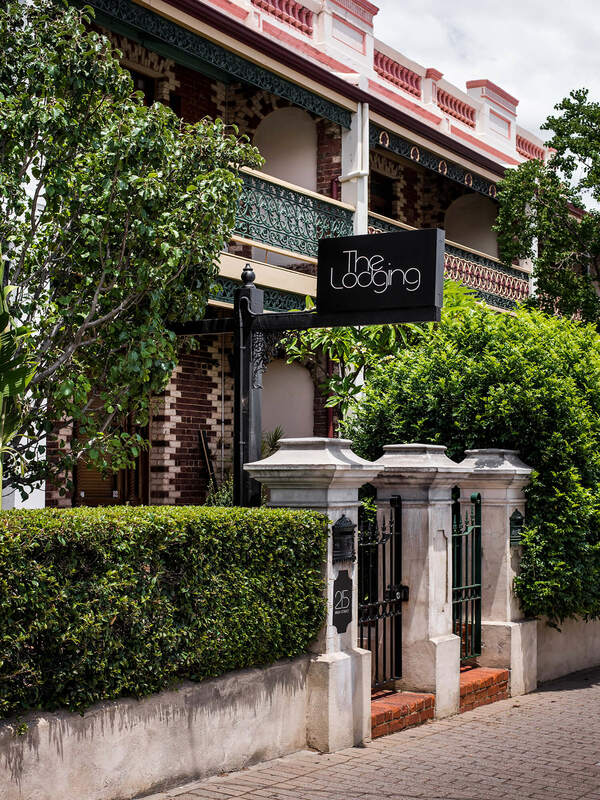 Purchased on a whim one weekend with her Mother, Jane took on the 10-month task of transforming the building from its former life as a Colonial-styled B&B into something more luxurious and upscale. 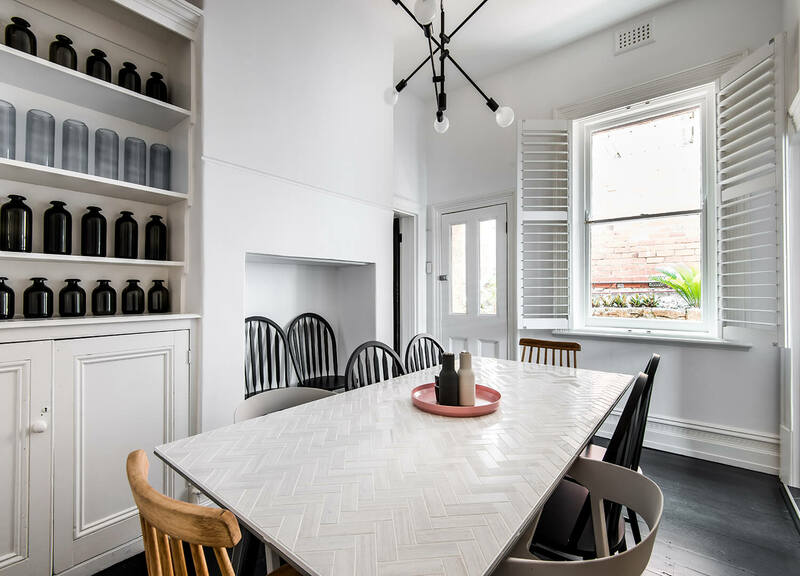 Once the renovations were complete, Jane breathed new life into the space using her eye for modern interiors and savvy styling – all of which she cleverly did herself. As well as the suites, there is a communal lounge, dining room, kitchen and leafy courtyard out back for enjoying an evening glass of wine. Or, why not hire the entire house to yourself? 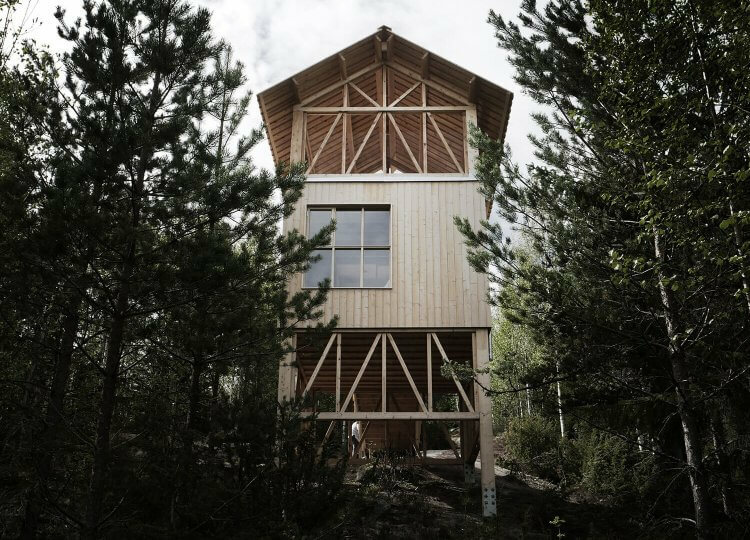 Perfect for a group getaway or for those looking for a little alone time. 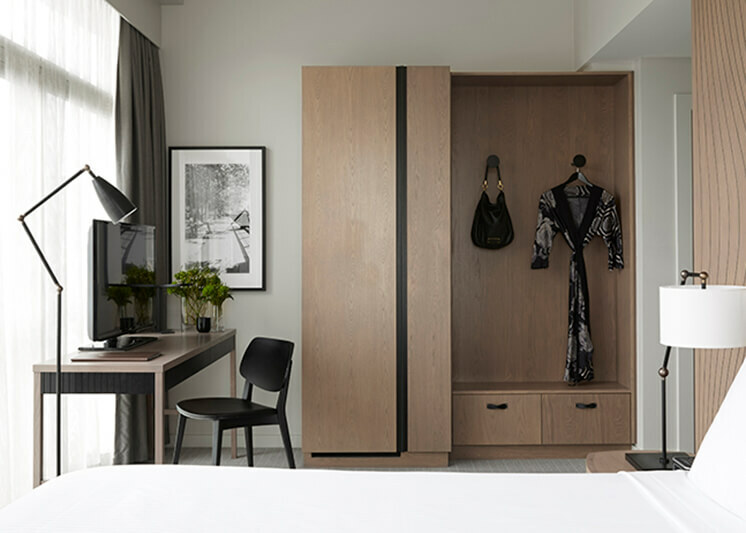 Emanating a sense of contemporary urban comfort and understated luxury, each suite has been fitted out in a stylishly monochromatic palette. Plush charcoal carpets and graphic black canopy beds stand out against the surrounding clean white walls and shutter-framed sash windows. 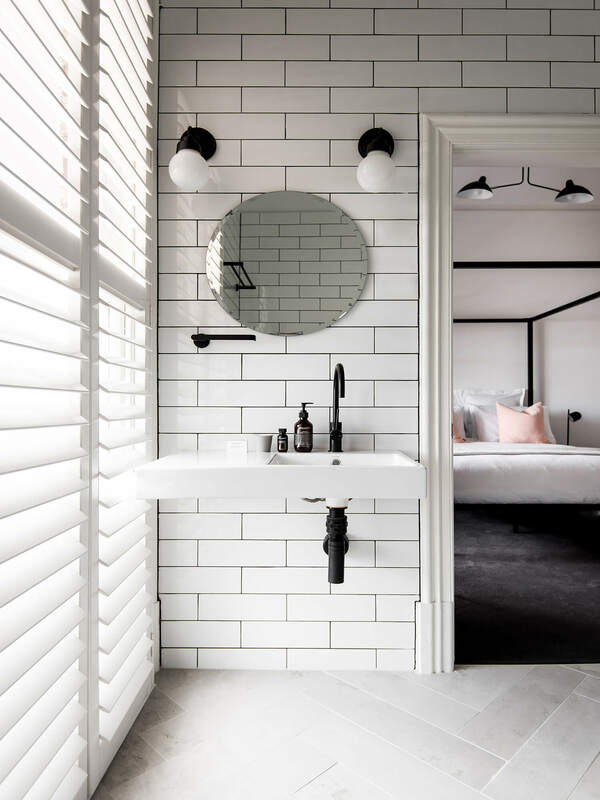 In contrast, each bathroom features white subway wall tiles which are complemented by custom cut porcelain tile herringbone floors and interspersed only by the matte black Phoenix tapware. 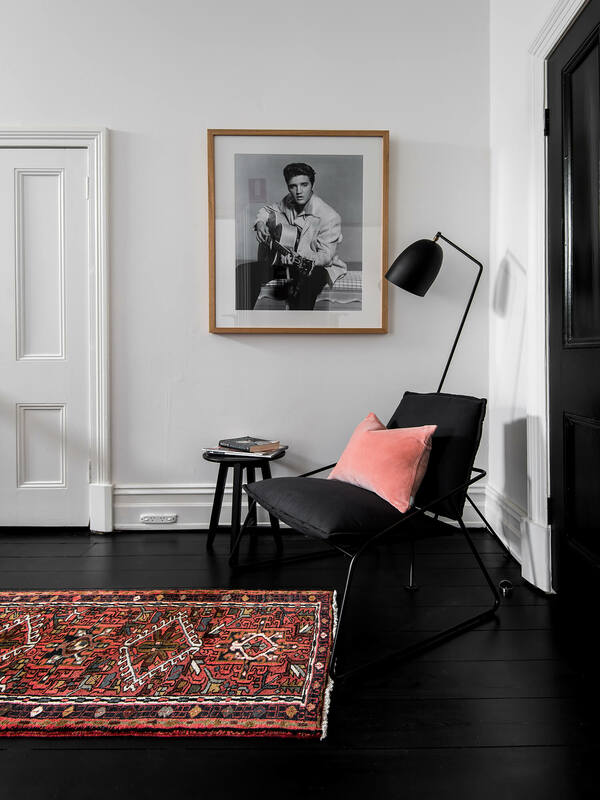 In the common areas a more relaxed feel is created using Persian patterned rugs which overlap the polished black timber floors. 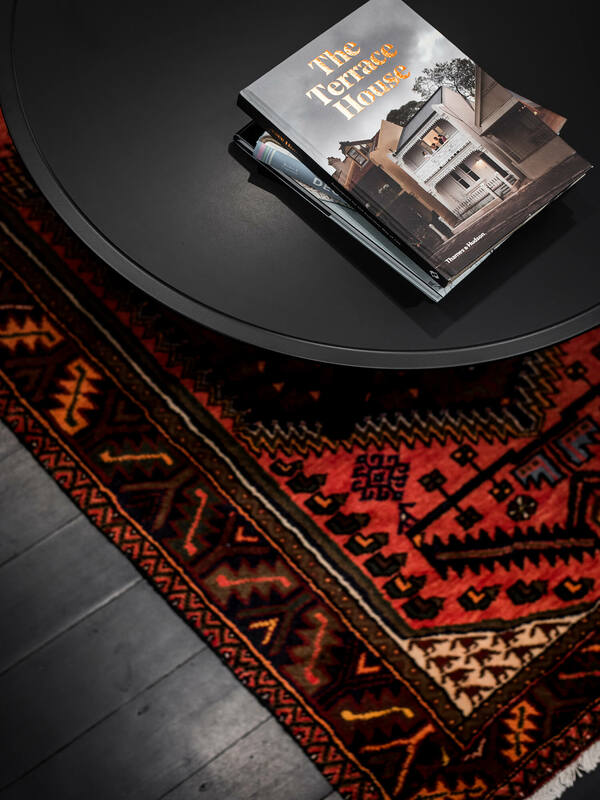 A chic selection of coffee table books encourages guests to relax and sit for a while. 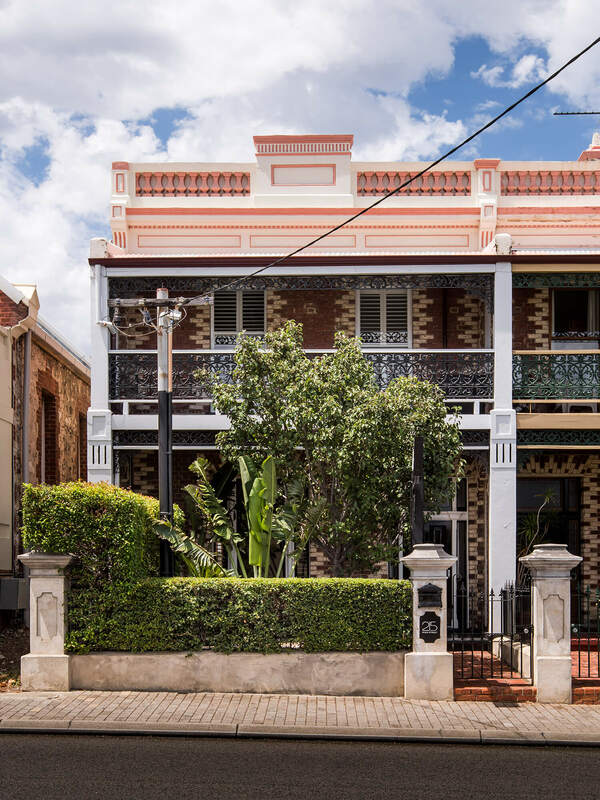 Add to all this, the original ornate timber joinery throughout the property and you’ve got a two-storey terrace with personality. 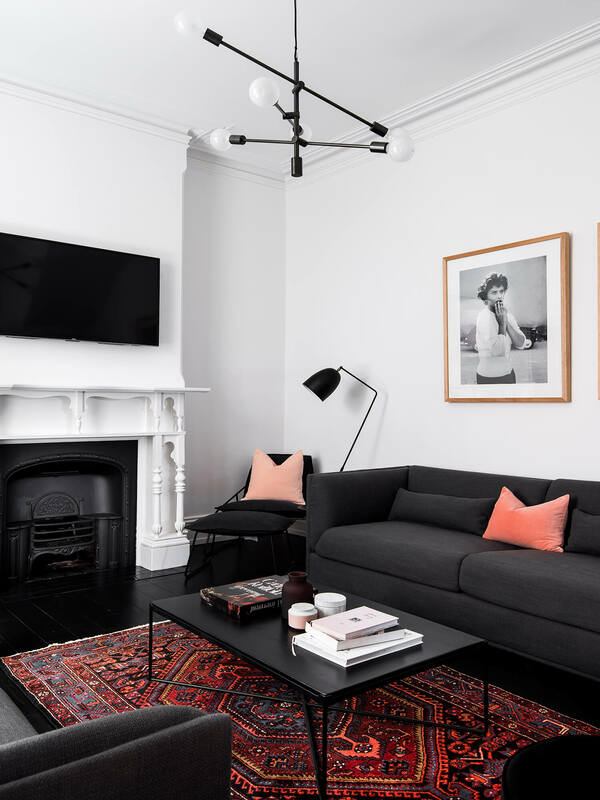 To soften the palette bold accents of dusty rose, soft salmon pinks and rusty reds highlight each zone. The framed photography of bygone Hollywood stars, such as Elvis, Sophia Loren and Faye Dunaway gives off a fun, retro Hollywood charm that says ‘yeah we’re cool, but we don’t take ourselves that seriously’. The Verdict? Bigger isn’t always better and we think this is boutique hospitality at its best. It’s perfect! 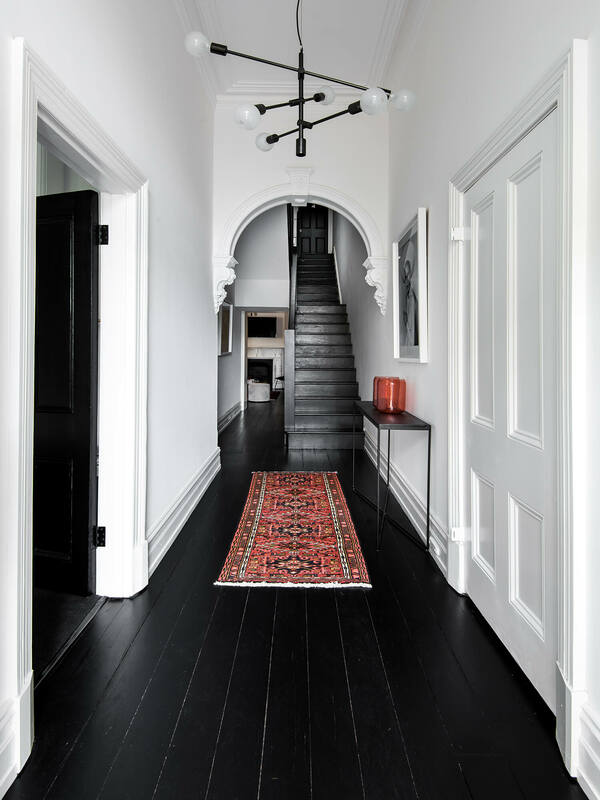 I love the combo of the graphic rugs with the black, it’s proof that a bloody good rug does amazing things.